Process Lasso is a useful tool with which you can use to help improve performance, stability and responsiveness of your personal computer. It can also be used to monitor active processes and the resources they are using. 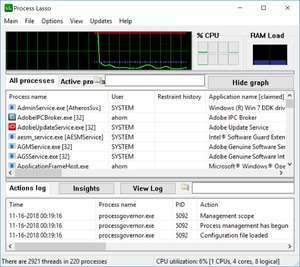 Although Process Lasso may be considered as an addon to Windows Task Manager, it is not a replacement for it. It adds adds new features to things you can already do with the task manager. Version 9.1.0.6 is a freeware program which does not have restrictions and it's free so it doesn't cost anything. For security reasons, you should also check out the Process Lasso download at LO4D.com which includes virus and malware tests. Additional screenshots of this application download may be available, too. Process Lasso has a presence on social networks. Process Lasso download been highly rated by our users.